We designed our Dream Lock Amulet VIII from a section of the special piece of 6500 year old beautiful Bark and Yellow-mocha colored Fossil Walrus Ivory we found on Nunivak Island in the Bering Sea. The hole was made by a Paleo Indian 6500 years ago! Time and the elements have turned the hole edges dark and made the hole in this aged ivory slightly more irregular. Our Dream Lock Amulet VIII is rough on one side and polished on the other. The bark side is enhanced with one of our lovely blue/green opals. Hangs with a lock-style bail. In Sterling Silver 1 1 3/4 inches high, 1 inch wide. This is a one-of-a-kind pice. Recognizing our hopes and dreams, and locking on to their messages whatever our circumstances, is what allows us to fix our minds on special goals and work towards them. Such goals can and have changed many lives. We designed our Dream Lock Amulet VII from a very special piece of 4500 year old beautiful mocha colored Fossil Walrus Ivory with a bark side we found on Nunivak Island in the Bering Sea. The hole in this piece was made by a native American 4500 years ago! Time and the elements have turned the edges of the hole dark and slightly more irregular. Such pieces have been unearthed many times in the burial places of Shamans - They could only have been used to look through the hole towards the things that Shamans alone can see. We designed our Dream Lock Amulet VII so that you could look through it again-and-again to find and remind yourself of your dreams and goals. We made it look like a contemporary lock to lock them in your heart. Reversible, it can be worn with the bark side out, so you can wear the side that fits your mood! 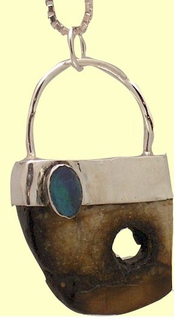 (Please see inset) In Sterling Silver, with a deep blue opal on the lighter side. 1 1/2 inches high, 1 inch wide. Please scroll down below to see Dreamlock Amulet VIII.